The Battles: There were many battles throughout the duration of the war. England controlled many of the early battles but would ultimately lose the ones that meant the most. The first major battle was the Battle of Sluys in 1340. England was able to retain control of the English Channel by defeating King Philip and the French army. 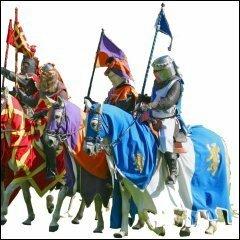 The Battle of Crecy in 1346 won by the English proved the power of archery over armor. The English lost less than 100 men while France lost thousands. 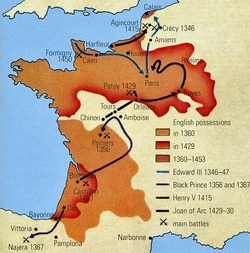 The Battle of Poiters in 1356 was similar to Crecy in that the French still held onto the old military battle methods and were defeated again by Englands' archers. The Battle of Orleans in 1429 was a turning point for the French as a young woman named Joan of Arc led the French army to victory. In both England and France the outcomes were roughly the same. Peasants in both countries took the heaviest impact of the war. They were forced to fight in the armies and had to pay higher taxes more frequently. The survivors were needed by the king as workers and soldiers. These people emerged from the war more powerful and smarter (Frey 153). Lost in the war were the nobles' knights, and knighthood altogether, and the use of castles. As soon as gunpowder was discovered and armies started using gunpowder, castles proved to have little use in battles (Frey 153). Though guns and cannons did much more damage than longbows, they were not as advanced or effective as the longbow because they often exploded (Lace 98). Also lost to this war was the fuedal system. As a result the power shifted from fuedalism to monarchs. In both countries monarchs and central government became more powerful (Lace 98). Before this war the common language spoken in England and France was french, but after the war began, England changed its main language to latin. They now considered french to be the "enemy language". Everyone had to learn to speak this new language, and books and important documents had to be rewritten in latin. The end of the war caused a whole new development in England (Lace 98).